The new album "Sotto prescrizione medica" is out!!! I started playing guitar when I was 11 or 12, thanks to the teachings of my great master: my father Franco. In 1997 I wrote my first song: Stella. It was the 10th of August, and I was at Rossal School of Fleetwood, England, for a study-holiday. the "Amici di Bacco" band, that we founded togheter with Michele Cevolo and the guitars Luca Carloni after the "Fuori Quota" break-up. Throughout this musical journey I have written several songs. Unfortunately I couldn't always play them with the bands I had, wich increased my wish to become a singer-composer. From 2001, the year of the "Fuori Quota" break-up, while I continued to play for a short period (2-3 months)with the Amici di Bacco, I started my soloist career. Since 25/08/2003 I have been associated toSIAE. Finally, in May 2005, finally came out my first demo CD:"La stella". In the summer of 2006, for organization reasons, the band broke up and only Mirco and Emanuele still play for me at this time. 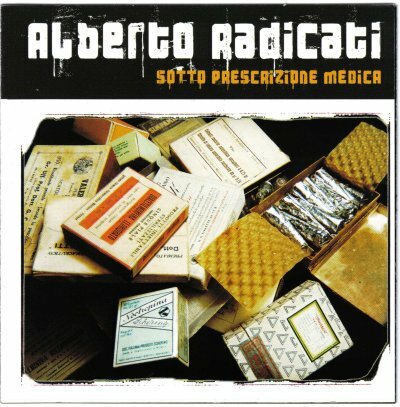 "Sotto prescrizione medica", which has come out in February 2007. Several musicians from the province of Viterbo have partecipated in the reconding: Chiara Celestini's vocals in two songs. Federico Lacerna's sax in one; Alessandro Giraldo sings in "Steso sul pavimento", song we wrote togheter, while Andrea Durantini plays the bass in two songs. My "fraternal friend" Gabriele Marianello accompanies me with the bass in three songs. Luca Giraldo also accompanies me with the cajon in another song. Of course, those who always "appear" throughout my album are Mirco Cicoria and Emanuele Giraldo playing keyboards adn electric guitars.